Ideal for workers who need to block out loud noise demand the best protection and comfort availab.. Ideal for workers who need to block out loud noise and demand the best protection and comfort ava..
100% PVC-Free. Independently tested NRR 27, with a new sound dampening additive. NRR 27 gives..
Soft material Easy to insert Blue colour specifically for the food industry Both the plugs .. Foam disposable ear plugs Found to be in conformity with council directive 89/686/E..
Moldex 6600 Pura-Band banded ear plug is ideal for when noise is an intermittent hazard. The ba..
Free standing or wall mounted Robust design Easy twist action dispenser Bottle rotates and .. Contains 500 pairs of ear plugs To be used in conjunction with the Ear Plug Dispenser SNR 34 .. 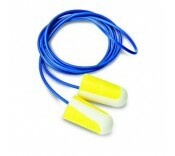 Product Discription New SNR22 foam ear plugs from Moldex - when noise is harmful but on a lower l..